Cast: Steve Carell, Morgan Freeman, Lauren Graham, Wanda Sykes, John Goodman. Story: A politician builds an ark. For God. Good Evans, could this be a sequel to Bruce Almighty? And with no sign of Jim Carrey ... it'll need some divine intervention to be any good. The last time I reviewed a movie that wasn't a sequel, Noah hadn't even got his feet wet. This one isn't even a proper sequel, it's just pretending to be because, well, it wouldn't be summer 2007 if it wasn't. The only things Evan Almighty has in common with Bruce Almighty is Morgan Freeman as God, and Steve Carell as that newsreader who blabbered through his TV news report. Do you remember that bit? That was the comedy highlight of the year as far as I was concerned, I literally cried with laughter in the cinema at that scene. Carell totally carries this movie, because apart from him, everything else is distinctly subheavenly. The premise is simple. Evan is now a politician who's told by God to build an ark. And then he turns into Noah. I shan't spoil what happens next, but it really makes no sense at all - like the religion itself, it'll leave you with more questions than answers. I did like, however, the comment by God that when you pray for something you won't get it - but you might get an opportunity to achieve it yourself. That's a nice way of looking at things. If you've seen Carell in Anchorman, The 40 Year Old Virgin, Little Miss Sunshine or the US version of The Office, you'll already know what a talented and versatile actor he is. His only comedy support comes from Wanda Sykes, whose offensive assistant routine is turning up all over the place lately. 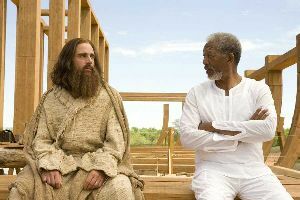 Apparently Evan Almighty is the most expensive comedy ever made, tipping the scales at a faintly unbelievable $200m, which makes me wonder why the CGI falls far short of the average action movie. The animals look very cut-and-pasted and the ambitious climactic scenes far outstretch the ability of the effects crew. Evan Almighty isn't a patch on Bruce. Steve Carell, however, saves it from being a turkey and in the end it was quite fun - which is something of a miracle in itself, all things considered. To enjoy this film you should be: able to let the plot problems drift over you. 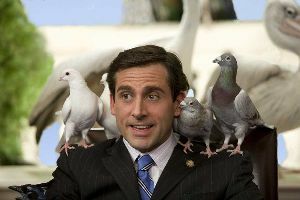 Evan Almighty was released in the UK on 3rd August 2007.